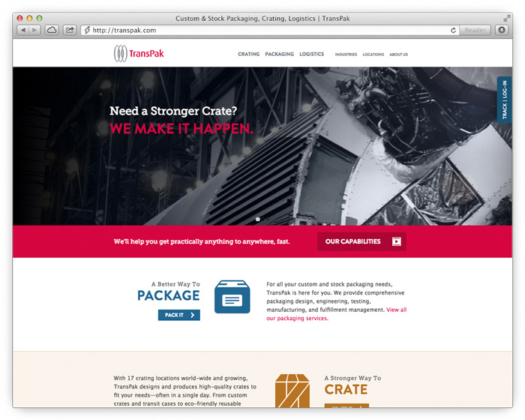 TransPak, a leading provider of logistics solutions, custom crating and packaging, has launched a new web site that highlights the growing breadth of services the company offers—from custom crating and packing solutions, to product prototyping, design and sourcing, to full service supply chain management. The new site includes industry-specific case studies that showcase the exceptional service TransPak is known for—whether shipping a 50,000 pound rocket engine or providing end-to-end supply chain management for sensitive Morpho airport security screening devices. "Our 'client-first' approach has enabled us to grow alongside many of the biggest names in the Valley, who have been our partners for decades," said TransPak CEO, Bert Inch. "With 17 worldwide locations and expertise in design, production and global logistics, we specialize in solving extremely complex crating, packaging and supply chain needs." Comprehensive packaging design, engineering, testing, manufacturing, and fulfillment management. From custom crates and transit cases to eco-friendly reusable solutions, TransPak can design the crate to fit your needs—often in a single day. End-to-end supply chain solutions ensure that all the details are flawlessly executed—from product protection to timeliness to customs clearance. Founded in 1952, TransPak is a worldwide leader of logistics solutions, custom crating and packaging. A key partner to leading technology companies in the semiconductor, aerospace, medical equipment, security, and solar industries, TransPak offers its customers a comprehensive range of supply chain services. Headquartered in California's Silicon Valley, the company has 17 satellite offices around the globe.